Watch The Quilt Show with Alex and Ricky for free this weekend! 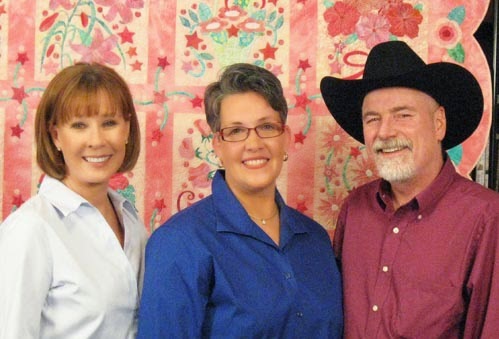 In honor of International Quilting Weekend, March 20-22, 2015, The Quilt Show (www.thequiltshow.com), the web TV show hosted by Alex Anderson and Ricky Tims, will open all of its shows from the first nine series – shows 100-1513 – for the entire weekend. This means that, for three special days, everyone will have the chance to view more than 200 shows featuring some of the quilting world’s leading artists, for free! As you may already know, I appeared as the featured artist on TQS in show 901. If you didn’t have the opportunity to see this show the first time around, now you’ll have the chance to see it — and so many other terrific shows — at no cost in this unprecedented three-day offer. I hope that you’ll share this information with all of your quilting friends. It’s a fantastic opportunity to enjoy three days of learning and fun without leaving your home.… all for free.